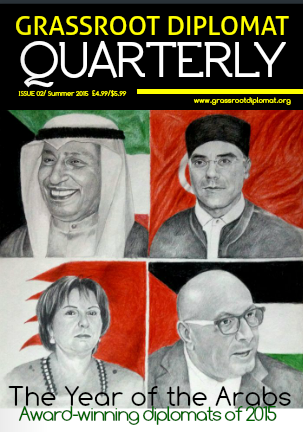 From their successes at the most recent Grassroot Diplomat Initiative Award, the second edition of the Quarterly Magazine celebrates Arab Ambassadors who have paved the way for their people in the face of adversity; from the challenges of revolution, to patriarchy, terrorism, and even occupation. Feature cover includes Dean of Diplomatic Corps HE Khaled Al-Duwaisan, Representative of Palestine Manuel Hassassian, Ambassador of Tunisia HE Nabil Ammar, and Bahrain Ambassador HE Alice Thomas Samaan. Other features include an interview with Bridget Jones director Baroness Kidron where she speaks of the founding of FilmClub and her latest campaign on the digital iRights framework. Find tips on how to invite an Ambassador to dinner for whatever cause you represent. Plus, read the thoughts of American actor Zero Kazama where he dispels media stereotypes of the Muslim community.